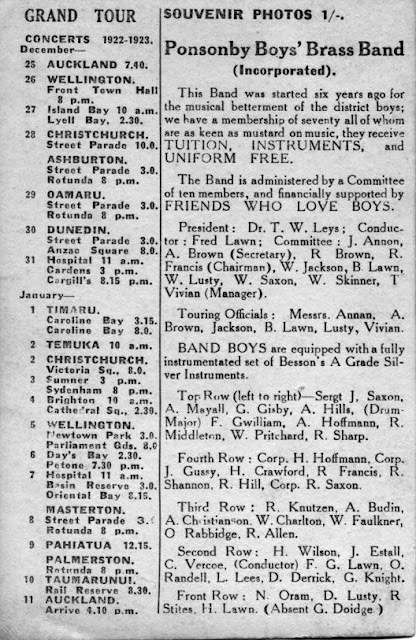 This image, from Lyn Dear’s collection, dates from 1922 six years after the Ponsonby Boys Brass Band had started in 1916. A public meeting of residents of Ponsonby was held at the Leys Institute last night for the purpose of electing officers and committee for the recently formed Ponsonby Boys' Brass Band. In opening the meeting, Mr C Hoffman explained that the band was formed last October, and a provisional committee set up. Mr A Norris was bandmaster, and started with three boys. Now they had fifteen members. The committee considered the time had now arrived when the brass band should be put on a sound financial basis. They would require assistance from the public. They were prepared to train boys who would come to the conductor. One aim was to keep lads from wandering aimlessly round the streets at nights. Mr T W Leys was then asked to preside. He said the object of the meeting was to put the band on a proper footing. The first business would be to decide the name of the band and elect officers and committee. That did not necessarily mean letting the provisional committee drop out. It would also be necessary to elect trustees. The secretary (Mr Foster) said Mr Norris had seven boys of his own and, starting with these, originated the idea of forming a brass band. Owing to the war members of the adult bands were enlisting, and it was felt that it would be well to train boys to fill the vacancies. As funds were needed to purchase instruments and music, it was decided to call a public meeting to enlist public sympathy with the objects of the movement. All services, including the bandmaster, were purely honorary. They had the opportunity of purchasing a set of instruments at very reasonable terms, and money was required to secure them. Motions were then adopted, “That it is desirable to form a boys' brass band,” also that it be called Ponsonby Boys' Brass Band. The following officials were next elected: Trustees: Messrs T Vivian, P Hunt, C Hoffman, and W McMath; bandmaster: Mr A Norris; secretary: Mr T Foster; and treasurer, Mr R Francis; committee: Messrs T Vivian, J L Francis, S Hunt, P T Bint, A Norris, T Foster, A Barton, C Hoffman, G Stewart and W McMath: five to form a quorum. The committee was empowered to elect a chairman and draft rules for the guidance of the band. A vote of thanks was accorded the chairman for presiding. In 1937, the Auckland Star got a bit carried away in describing the band as the first to form in NZ. 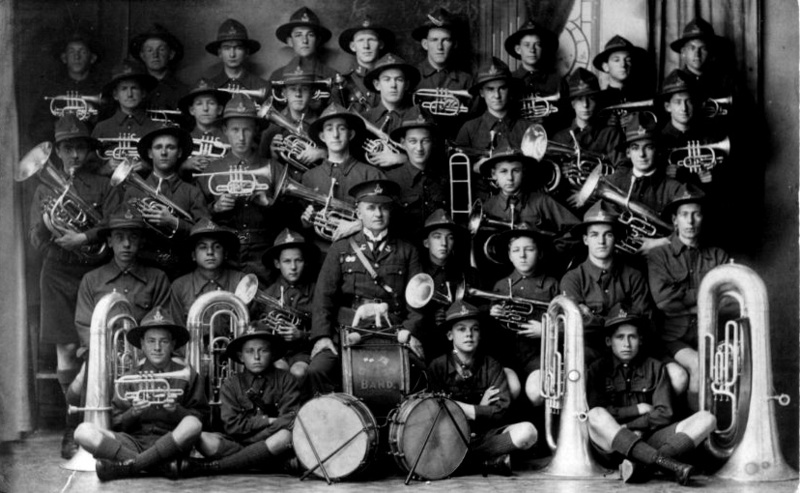 The Ponsonby Boyd Fife and Drum Band was started in 1910 at the Leys Institute. The twenty-first anniversary of the Ponsonby Boys' Brass Band will be celebrated with a children's fancy dress carnival in the Band Hall, Jervois Road, Ponsonby. next Thursday night. 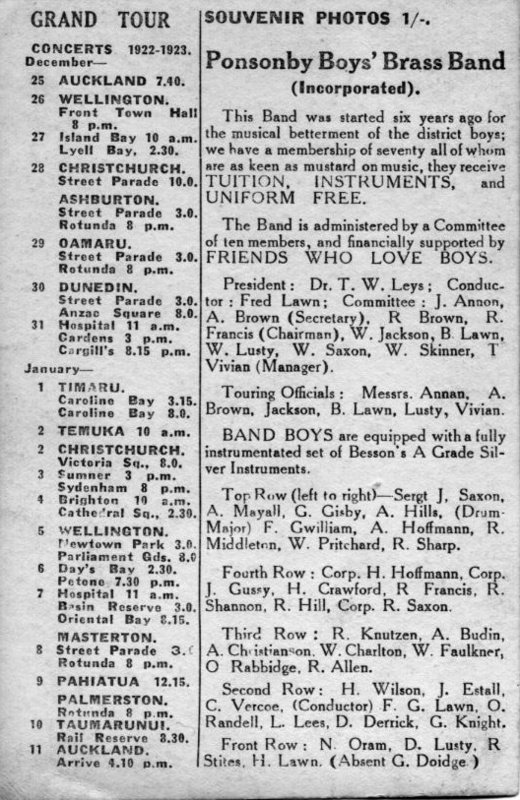 The first boys band to be formed in New Zealand, the Ponsonby Band was organised in October 1916, by a committee consisting of Messrs T Foster, C Hoffman, A Norris (bandmaster) and R Francis. Mr Francis is the present chairman of the committee. Over 600 boys have received their training in the band, and many of them are earning their living through their musical ability. From the date of its inception the band has given many performances at public hospitals and institutions, not only in Auckland, but throughout New Zealand. During the war it turned out to play the reinforcements away, and for 13 years, it acted as senior cadet band of Auckland. The band incorporated at some point before the 1940s, changed the name to the Ponsonby and Districts Silver Band Inc c.1967, but disbanded in 1968 due to lack of members. Remaining equipment was given to the Boystown Police and Citizens Club band. In 1984, at a function to open refurbished meeting room at the Leys Institute, the Mayor of Auckland at the time, Catherine Tizard, made reference to the band, and how “a revival of the Ponsonby Boys' Brass Band could be a way to keep young people off the streets,” echoing what C Hoffman had said in a different society 68 years before. I wonder if the band really did stop the boys "wandering aimlessly round the streets at night". After all, 1916 was the third year of the war, adult males were overseas and mothers were having a tough time looking after home and family. I hope it worked. Luna Park -- Auckland's "Coney Island"